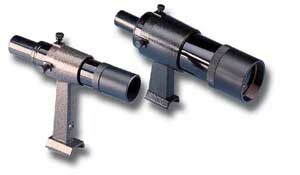 These scopes, mounted on the main instruments as secondary scopes, are invaluable tools in locating objects in the sky. 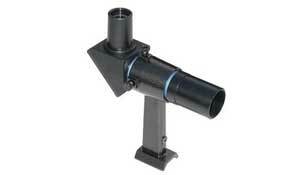 This 6x30 achromatic finderscope is a good choice for any telescope, both astronomical and terrestrial. It can also be used as a replacement of the standard 5x24. The diecast mounting bracket is sprung loading for easy alignment. 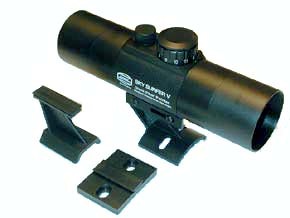 This large, fully-coated achromatic finderscope features a crosshair eyepieces, 9x magnification and a 50mm aperture objective lens. it provides a brighter, sharper image than smaller finderscopes.The diecast mounting bracket is spring loading for easy alignment. Provides an upright image with reversed left/right orientation. Matches the image seen through Refractor or Maksutov-Cassegrain telescopes with star diagonal. Provides exceptionally comfortable and convenient operation compared to a traditional straight-thru' viewing finder. Provides exceptionally comfortable and convenient operation compared to a traditional straight-thru' viewing finder. A fantastic little head light for localised illumination. Powered by a single AAA battery (supplied), this compact LED headlight from Tracer weighs just 23g. Three modes of beam are selectable by simply twisting back and forth the light head. 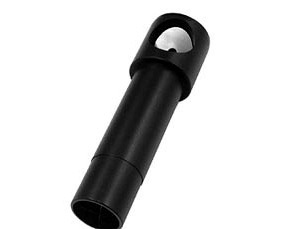 The light is manufactured using high quality anodized aluminium. It can be removed from the comfortable head strap, for battery replacement and also remote use. A removeable pocket clip is supplied. The SLA Astro Power Station packs a surprising punch. The heavy-duty battery will run a telescope for days, or a telescope and small anti-dewing system all night. Versatile and powerful, and unlike many other 12 battery packs this small compact unit is supplied in a handy ballistic nylon case with a waist strap making it extremely easy to carry to a dark sky site. Supplied with fused connection and a 12V telescope connection cable with range of tips and an AC mains charging unit. Just ¼ of the weight of a traditional sealed lead acid battery, this 12V lithium polymer battery pack will easily fit in a coat pocket or clip to your belt. Gone are the days of carrying heavy lead-acid batteries. You won't believe the difference! The heavy-duty battery will run a telescope for days, or a telescope and small anti-dewing system all night. Versatile and powerful, and unlike many other 12 battery packs this small compact unit is supplied in a handy ballistic nylon case with wide shoulder strap making it extremely easy to carry to a dark sky site. Supplied with fused connection and a 12V telescope connection cable with range of tips and an AC mains charging unit. Perfect for chilly evenings outdoors stargazing, the Exotherm Hand Warmer is convenient, reusable, and made from nontoxic materials. Heat lasts up to 1 hour. The Polar axis finder scope is a very useful accessory for EQ3-2 and EQ-5 Sky-Watcher equatorial mounts. It speeds up and refines the polar alignment procedure so the observer can spend more valuable time observing, rather than setting up. The Cheshire Collimation Eyepiece is ideal for precise collimation of Newtonians and helpful for aligning Schmidt-Cassegrains. This special eyepiece fits into 1�" focusers or diagonals. Alignment is easy using the small opening on one end and thin cross hairs at the other end. 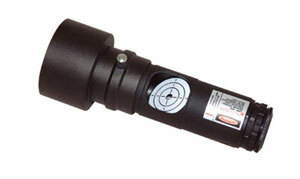 The collimation eyepiece is more accurate than the simple Collimation Tool. Most damage to stored Optics equipment is caused by humidity trapped within the enclosed storage area itself. Humidity trapped within enclosed space turns into almost imperceptible condensation which causes irreparable damage. Silica gel prevents these moisture related problems before they begin. Silica gel creates a protective shield of dry air within any enclosed storage area. The Silica Gel crystals have a built-in indicator which turns from pink to green signalling when the product is saturated with moisture and needs reactivation. Once saturated with moisture, silica gel can be easily reactivated in a conventional oven for lifetime protection.